Ten minutes west of Waiuku township or roughly an hour from Auckland City is Karioitahi Beach, another of the black sand beaches. There is a restaurant over-looking the beach, the only one I can think of on the Auckland west coast with this amazing view. Prices looked a little high but I did sample something off their mid day menu, unfortunately it fell short of the menu description, not that it wasn't "OK". I would much rather the plate over-deliver on the menu than the other way around. Having said that service, table settings etc was very good. 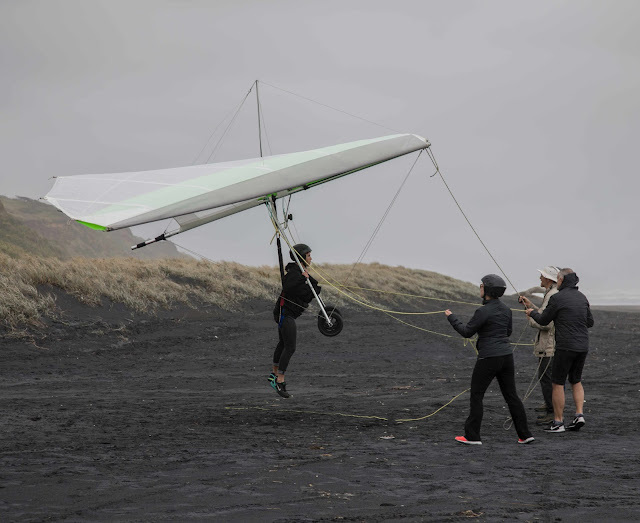 people learnt to hang glide by running down small hills before leaping off a cliff.